Thirty-eight years ago during a road trip I discovered Life-Like 1/48 model airplanes at a shopping plaza in Madisonville, Kentucky. In the era of boring box tops merely featuring a photo of the built subject model, the dramatic box art of Life-Like, and the novelty of 1/48 Golden Era biplanes, was too much to resist. I leveraged my allowance to buy the Gloster Gladiator, recently discovered in a comic book story illustrated by the late-great John Severin. Up to then my experience with quarterscale biplane models revolved solely around Aurora Famous Fighters, so the detail of the Life-Like model was incredible. The model was, at the time, so awesome that I built another one, which I still have. Oddly, the models never became available in the area I lived in and it took a few years to find them elsewhere. I built their Fairey Flycatcher and the Bristol Bulldog, and vowed to eventually build the entire range (still working on that)! Today I still have the Gladiator, while the Bulldog was given to friends Karen & Tony; I don’t recall where the Flycatcher went. Life-Like also released an extensive collection of 1/1 scale handguns, 1/16 motorcycles, coaches and pioneer wagons, dinosaurs, ships, vintage automobiles, vintage cannons, field guns, and howitzers, and no doubt more. I do not know the year that Life-Like decided to abandon the non-railroad models although it seems to have been in the late 1970s. As for who ended up with most of those molds, please read on. I am 99.9% certain that the Bulldog, Flycatcher, Fury, and Gladiator Lindberg. This I know from examining the Lindberg kits, although Lindberg’s Gladiator has a three-bladed propeller instead of the two-blade of the Life-Like/Pyro kit. Life-Like made very few if any of it’s own molds – in this respect they were like UPC. They either leased or purchased older molds. Life-Like entered the plastic assembly kit forum ‘in force’ with the lease and later acquisition of the Pyro molds. The Life-Like handguns, dinosaurs, most ships, vintage automobiles and some motorcycles came from Pyro. The old field guns came from Palmer, and some ships, helicopters, missiles, military vehicles and modern artillery from Adams. The coaches were from Miniature Masterpieces, which was originally and Adams/Revell project. And the end of Life-Like, most of the Pyro molds migrated to Lindberg. Some were cleaned and modified and others were released “as is”. Adams also produced ships and some aircraft as well as some western kits like the ‘Stage Coach’ (probably from Miniature Masterpieces). Among these were the M1 120mm AA gun, Hawk Missile Battery, Atomic Cannon, LTV(A)(4) Winnie the Whale, 105mm gun, Hawk missile battery, Missile transport helicopter, Swedish Draken Fighter (later Lindberg), Vanguard, Honest John and Thor missiles and N.S. Savannah Nuclear Cargo Ship. Some of those models are listed below. The Bristol Bulldog, perhaps the most famous RAF fighter between the World Wars, was designed in 1926 by the Bristol Aeroplane Company. Over 400 Bulldogs were produced. Bulldogs never fought for the RAF and were withdrawn from Fighter Command in July 1937. The Bulldog proved to be quite a successful export to foreign air forces, seeing service with Australia, Denmark, Estonia, Finland, Japan, Latvia, Siam, Spain and Sweden. Bulldogs battled against the Spanish Republicans in the Spanish Civil War, and 19 Bulldogs also saw combat with Suomen Ilmavoimien ( Finnish Air Force) during the Winter War against the Soviet Union, gaining six kills by five pilots for the loss of one of their own. A Bulldog scored the first Suomen Ilmavoimien aerial victory, an I-16, by SSgt Toivo Uuttu on 1 December 1939. SMER also issued a 1/48 Bristol Bulldog. The accounts I’ve read indicate that it is a lousy kit. Life-Like packed the model sprues loose in a light weight top-tray box. Inside are over 60 silver injection plastic parts, a clear windscreen, decals, and the instruction sheet. The sprues have quite a bit of flash, and there's some on the parts. Also some noticeable seam lines and ejector circles. I haven’t noticed any sink marks, though. Judging the model against those of the era by Aurora, Lindberg, Monogram, Revell and Tamiya, Pyro/Life-Like kits were somewhat sophisticated. Life-Like’s engine and four-piece pilot figure is detailed, if clunky. Fabric texture details the surface, as do basic duze fasteners and hinges. Panel line detail is raised. However, much detail is ‘soft’, such as the .303 machine gun muzzles that protrude into their troughs from under panels, although some small parts, i.e., wing navigation lamps, are finely molded. 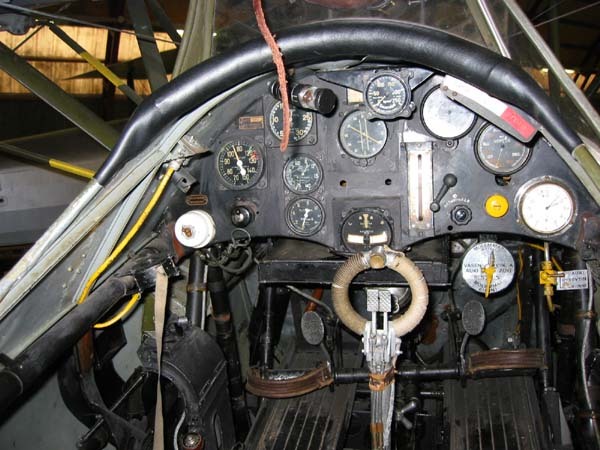 The cockpit, a floor, seat, instrument panel, and stick, is simple – and wrong (at least for the Bulldog IV, preserved in Finland). The panel is misshapen. Bulldogs did not have a cockpit floor, rather rudder troughs. I don’t know what the seat looked like, although the cockpit side structure was steel tubing. Look at the nice decals – sharply printed, opaque, in register, and not too thick. And not yellowed after 30 years. Markings for only one aircraft are offered, Bristol Bulldog Mk.IIA K-2171, 32 Sqn RAF. Sadly, this aircraft crashed 30 October 1935, when it lost a wing on recovery from a dive during ferry flight, crashing into the sea, killing P/O Haldane Georgeson RAF. * When I build it I‘ll probably paint it for foreign service. Spanish Bulldogs had colorful rudders and rear fuselages, and I am a fan of the Suomen Ilmavoimien, even though Finland flew the Mk.IV, and this model is an Mk.IIA. Only basic painting guidance is provided. Instructions are narrated and illustrated with an exploded diagram. A good history is provided. One nice feature is detailed instructions for rigging the model with thread. You can rig the model with a single piece of thread. While this technique doesn’t pass muster with serious modelers today, it is strong and saved my newly built Gladiator from destruction from the clumsy hand of my girlfriend 30 years ago! I built this kit decades ago and recall it as a good model. The Gladiator fit together well and I recall the same for the Bulldog. Exterior detail is mediocre compared to kits of today. The engine is fair but clunky. The cockpit is bad although the pilot should keep the interior from scrutinizing eyes. Nice decals provide colorful markings. Overall, I think this model can be worked into an eye-catching model worthy of anyone’s collection. Recommended. * Aviation Safety Network. ASN Wikibase Occurrence # 68561. 30 April 2012. Highs: Nice fabric texture. Decent detail and nice decals: sharply printed, opaque, in register, and not too thick. Lows: Simplified and clunky detail. Seam lines and visible ejector marks. Verdict: These kits can be built into good models. Hi Gang, The review is updated with more info.